Sivan is a 2-year-old girl. She was born in Iraqi Kurdistan in a family of Syrian refugees. Before fleeing Syria, her father was a construction worker. When the civil war began in his country, he was asked to join the army, but he chose to leave and search for a safer life in Iraq. 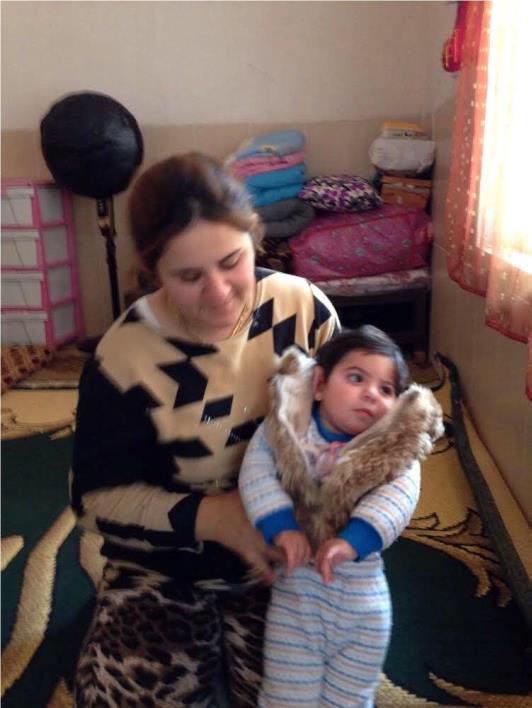 In Kurdistan, he found a wife and in 2015, Sivan, a warmly expected daughter was born. His life was finally moving towards a brighter future. However, during Sivan’s delivery, complications occurred and for 2 weeks she was kept alive trough artificial breathing support. When they finally were released by the hospital and went home, it appeared clear that long-term consequences were to be expected. In fact, Sivan was soon after diagnosed with cerebral palsy and so she will always need assistance and special care. Her devoted parents try to do everything possible to make her life easier. They regularly visit a specialist and they attend physiotherapy. Just because of their patience and perseverance, her movements are slowly improving. We have been supporting Sivan already for more than one year, and thanks to financial support of the French Association for the Aid of Youths with Disabilities and People with Handicaps (Association pour l’Aide aux Jeunes Infirmes et aux Personnes handicapées), we could continue for longer. Especially since August 2018, STEP-IN opened a new Physiotherapy Clinic and we are now looking forward to keep following Sivan in her improvements.